This is Ansh Pallai. Only four months in age. He brought sky-full of happiness to parents, Smt. 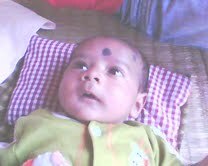 and Sri Sudarshan Pallai on coming to earth on the New Year’s Day, 2011. Pallai works for the Kanak TV at Bhubaneswar. 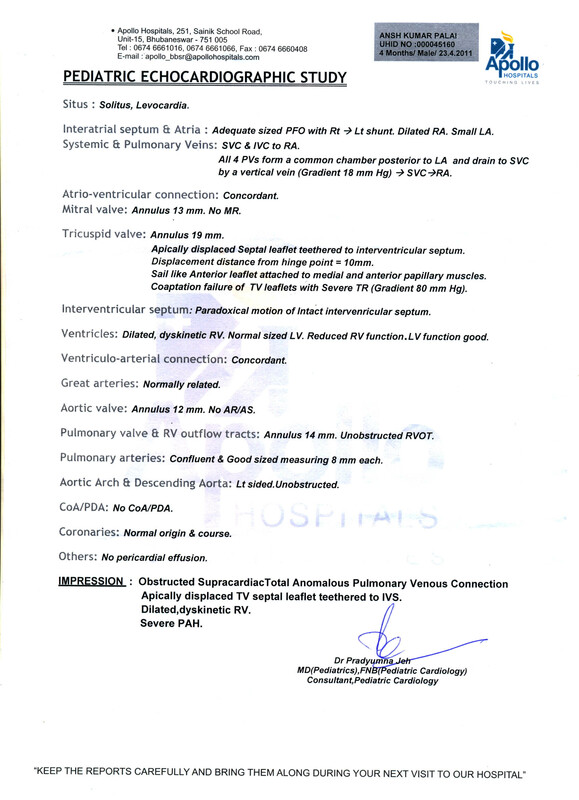 But now, the parents have lost their sleep, as Apollo Hospital, Bhubaneswar, whereto he was taken for pediatric consultation, has diagnosed him as a case of complicated heart ailment: CHD-TAPVC. According to the Hospital, Ansh needs immediate surgical intervention. The treatment may cost around Rs.3.5 lakhs. Sri Pallai’s works against a salary that cannot shoulder this cost. As discussed earlier in these pages, the Orissa Working Journalists (Welfare) Fund is of no use as its provisions are ridiculously impractical. In the circumstances, Media Unity for Freedom of Press (MUFP) has appealed to all media persons and media houses of Orissa to contribute to the best of their ability to the child’s treatment fund directly at his father Sudarshan Pallai’s Saving Bank Account No.20062339713 in Laxmisagar Branch of State Bank of India or by cash, cheque, Bank Draft or money order to Sri Pallai at Kanak TV, B-27, Rasulgarh Industrial Estate, Bhubaneswar. For proper coordination, the contributors may inform MUFP through the coordinating member of its Presidium, Sri Prasant Patnaik at patnaikprasanta@gmail.com, MUFP has suggested. It may be noted that recently on appeal of MUFP for treatment of MBC TV Camera Person Sri Laxmidhar Mohapatra, media persons and organizations of Orissa had contributed around Rs 2.25 lakhs. Over and above this amount, the management of Kar Clinic Hospital had also given a concession of Rs. 30 thousand on their total bill on request of MUFP Presidium member Sri D.N.Singh. Mohapatra has been released from the hospital and is steadily recovering. For such support, MUFP has been extremely obliged to media friends and media houses. It is now a fresh appeal. MUFP is conscious of financial constraints that majority of media persons and media organizations of Orissa are facing. If, despite that, it is possible to contribute for treatment of the four month old child, it would be the most humanitarian act on part of the members of media fraternity. By the time of posting of this information, the information we have received indicate that in response to MUFP e-mail, friends have already started remitting their contributions.